I’ve done webinars before for my crowdfunding consulting and plan on doing more in the future but I have to give most of the credit for this post to Steve Chou of My Wife Quit Her Job. Steve sells his ecommerce course through a webinar and is the go-to resource for making huge money with the process. Using the process Steve shared at a recent conference of financial bloggers, he was able to turn his first webinar into 60 course students at $1,000 each. That’s a $60k payout for about 90 minutes of work. Granted, Steve can spend as much as $10,000 on promoting each webinar but that’s still $50,000 in profit. That’s one webinar and more money than a lot of people make in a year. Considering that 83% of bloggers make less than $2,500 a month and only 10% make more than $15,000 per month…Steve’s success with his webinars and courses makes him a blogging superstar! It’s not good money…it’s WTF money. The kind of money that means the difference between vacationing in Paris, France or Paris, Texas. The best part is that much of the webinar process to make money is automated. You set up things like your Facebook ads and email series to run automatically and can use most of the same webinar material every time. Steve now does a webinar each month and makes between $30,000 and $70,000 each time. Unlike most of the ideas we’ve covered in our make money blogging series, webinars don’t usually make money on their own. The webinar itself isn’t the product but part of your sales funnel to sell the end product. So we’ll start off with how webinars are used to make money and products you can sell before getting to Steve’s process for making huge money with webinars. How are Webinars used to Make Money? I’ve seen bloggers try to sell people into their webinar, charging for a virtual ticket, but it usually doesn’t go over very well. Most webinars are promoted as free so that’s what people have come to expect. Try to charge for your webinars and you better warm people up with a lot of buildup on your blog or through other promotional material. There are some bloggers that use webinars as a one-off product, charging up to $100 for an hour-long presentation. Many use a shorter, free webinar beforehand to sell into the actual product so the process we’ll talk about here is pretty much the same. 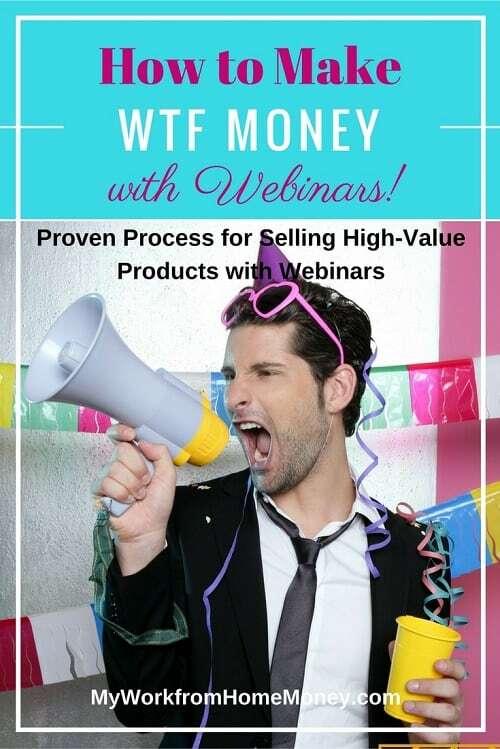 For the most part, Webinars are much better suited as part of your sales funnel to drive people to a higher-priced course or consulting product. The point about ‘higher priced’ is important. It doesn’t make as much sense to spend the time and money involved in our webinar process below to drive people to lower-priced products like ebooks and printables. I have paid up to $5 per signup for promoting webinars I’ve done and Steve spends between $2 to $4.50 per signup to his webinars. Steve’s experience is that the average attendance rate on signups is 25%, one person attends for every four signups, and the conversion rate from attendance to product signups is between 5% and 16%. That means you need as many as 80 webinar signups for each product sale (1 divided by 5% divided by 25%) and it could cost upwards of $320 in advertising. Note this is a high estimate and you might be able to get it down to as low as around $106 for each customer (1 divided by 15% divided by 25%) but the idea remains. You’re certainly not going to spend this kind of money if your products are priced at $50 or below but it makes much more sense if you can sell a $1,000 course. People may not need much convincing to buy your $4.99 ebook or printables. You can sell these through landing pages on your blog. Ask someone to come up with a grand for a course and you better be ready to demonstrate some amazing value and take some time to sell them on the product. That’s where the webinar comes in. So before you go through the trouble of using Steve’s kickass webinar strategy, it makes sense to develop a product that will make it worthwhile. This product better be high-value and be worth the money you are asking people to pay. It should come from your expertise in a very specific area and be backed by your own personal success. Anything less and people are going to have a hard time justifying shelling out $500+ for the product. What can you sell that is worth a few hundred bucks or more? The most common high-value products are courses, classes, consulting and membership sites. Courses: These are usually a set of pre-recorded videos, workbooks and curriculum to teach someone how to do something. Most are supplemented with regular live Q&A sessions. Classes: The difference between classes and courses is that classes are generally delivered in a live-video format. You schedule the classes and give people a link to the website or software and then give your presentation live before answering questions. Classes use all the material used in courses as well but are a much more interactive format so you can usually charge more. Coaching or consulting: This is very much like the class but done on a one-on-one format so can be the highest price charged of the three. Membership Sites: This is a part of your website that is behind password protection, offering members special content and access to you. Membership sites can be a lot more ongoing work than courses or classes because they have no finite schedule. We’ll cover details for setting up and making money on a membership site in another post. The idea behind any of these is that you have special experience into something that will make people money or help them be a better person. Search through online course website Udemy and you’ll see that the options are pretty much endless. It comes from your own personal experience. You need to be able to demonstrate that you have special insight into the topic that is valuable to others. It comes from an impressive personal win. It’s one thing to have worked in a topic for 10 years. It’s another thing altogether to have turned your experience into a five-figure monthly income. If you haven’t been able to be truly successful in the topic, how are you going to teach others to be successful? Finally, you have to be able to teach others to be just as successful. Try your course out on a few test subjects before the launch. These early test cases will not only help you work out kinks in the material but will be great selling points in the webinar. That said, one of the biggest hurdles for many people is impostor syndrome. It’s that nagging feeling you get that says, “Who the hell am I to be charging people $1,000 for a course?” It’s something that even the most successful bloggers worry about but you just have to get over it. You beat impostor syndrome by being good at what you do. Set high goals for your business and work to reach those goals. Over the course of a few years, you’ll build the experience to be able to meet all the conditions above. Look back through your own personal wins and you’ll find all you need to justify that value to students. Developing the actual product itself should be fairly easy at this point. You will be putting everything you did to be successful into a teachable format. It helps to go to Udemy and check out some of the courses to get ideas on delivery and flow. Most of these video courses are more basic than you will want to make yours but they can still help develop ideas. Videos – Even if your class is live, consider putting together some tutorials that people can watch to help explain important topics. Workbooks – Students want a detailed and guided process to be successful in the topic. Just telling them what to do isn’t enough. A workbook can help organize the process and guide them through each step. E-books and curriculum – There’s only so much you can get across in an hour-long class or a few hours of video. Supplement your course with an ebook that really details the process to be successful. FAQ handout or guide – You want to highlight and address the common sticking points through a special handout. Putting it in an ebook risks getting buried in the material. People love quick-start guides and it goes for common questions as well. Office hours – Whether your course is recorded or live, it’s always good to offer some kind of live interaction where you can answer questions and offer updates to the process. Teachable and Udemy are both popular platforms for hosting pre-recorded courses. You may not be able to sell a course for as much on Udemy, the maximum you can charge is $200 per course, so that may affect your decision. That’s a pretty big lead-in to get to our webinar process to make money but it’s important to lay the groundwork for why people make money with webinars. We’ll first cover how to get people to your webinar and then how to convert them to buy your courses or classes. Promoting a webinar is always a sticking point for bloggers. It can be scary to spend a few thousand dollars to advertise a webinar before you’ve made any money on a product. This is really where testing your course and perfecting it with feedback comes in. Put together a great course that stands a good chance of making someone a lot of money and you’ll have no problem investing in marketing. Your webinar marketing starts with the landing page on your website. This is a page dedicated only to getting people to sign up for the course. Check out Steve’s landing page below and note some of these important ideas. Landing pages are made on special plugin software, not an ordinary page on your site. This allows you to focus people on a sign-up button instead of all the clickable options in your sidebar. Countdown clocks work great for landing pages. You need to build that sense of urgency in your language that drives people to sign-up now. Bullet point your biggest selling points so people can scan the page quickly. Get testimonials from people that have tested your course to give readers social-proof of its value and highlight recognizable brands you have appeared on. Use your picture to show you are a real person and language that establishes a personal connection with readers. This is just a one-page snapshot of Steve’s landing page. It actually goes on for quite a bit more with testimonials, reasons why you should sign up, his own personal success story and more detail on what you learn. Landing pages aren’t just for products you intend on selling through webinars but can be used for any product or even selling affiliates through your blog. Landing pages are great because they give you the chance to really focus a reader’s attention on one idea or product. I use landing pages for my book launches and get a 10% conversion rate. That means one person signs up to the list for every ten that make it to the page. It may not seem like much but it is much better than other signup forms or list-building methods that may only get one in every 20 people to sign up. Next is actually driving people to your landing page for sign-ups. I’ve seen a lot of different advertising methods for these including Google Adwords, email marketing and setting up an affiliate program with other websites. The three methods that work the most efficiently seem to be Facebook advertising, guest posts and banners on your own website. Guest posts are popular because they don’t cost any money but can reach large audiences through other blogs. It helps to have a relationship with the other blogger before pitching a guest post on their website, otherwise they may want to charge for the post. Be sure to offer real value through your guest post topic. Your post should be at least 1,000 words and really help the reader solve a problem or offer some great advice. This is your first chance to build credibility with the reader and you’ll need to offer a great article if you ever want to post as a guest on the site in the future. It’s best if you can get a link to your landing page within the content of the post but at a minimum you should be able to include a short paragraph about your course and a pitch for the webinar at the end of the post. Banners and links on your own blog are always an easy option in promoting your webinar. Unless you have a very large website audience, this method may not drive a lot of people to your landing page but has its advantage. The method benefits from selling to a ‘warm’ audience, someone that already knows you. Have someone on Fiverr develop a 300×250 and 728×990 size banner images for your webinar and put it in your sidebar and the header to your website. Make sure you update all your most popular posts with a brief pitch for the webinar and a link to your landing page. 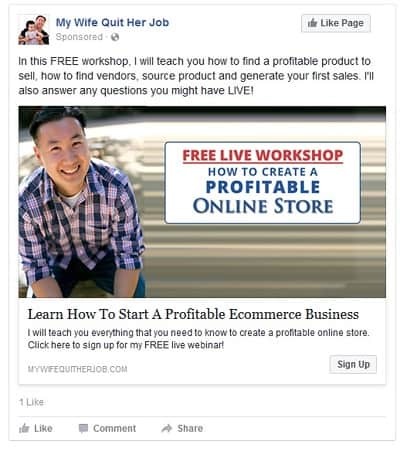 The most popular way to advertise a webinar has been through Facebook ads. Facebook is much cheaper than advertising on Google and offers some great targeting options to get your pitch in front of the right people. I use Facebook ads myself for affiliate posts, book launches and sponsored posts. Steve offers a strategy for three Facebook ads targeted to different audiences. Advertise your webinar to ‘warm’ audiences by targeting visitors to your website and fans of your Facebook page. You target website visitors by placing a retargeting pixel (a short piece of code provided by Facebook) on your website. These people know who you are so you don’t have to get over that awareness and trust hurdle. Make sure you use your picture in the image so people recognize you and feel more comfortable clicking through to the landing page. As with all your Facebook advertising, consider making multiple ads with different headlines, images and descriptions to see which one gets the best click-through rate and the lowest ad prices. Another group to target your Facebook ads is to look-alike audiences and to interest targeting. A look-alike audience is one built on similarities with people that like your FB page or based on an email list you upload. You don’t need to use an image with your picture in these because targets don’t know what you look like anyway. Try out a few different images to see which work best. Steve shares that he pays between $2.50 to $4.50 per lead for these ads compared to less than $2.00 per lead for advertising to ‘warm’ audiences. A final option for Facebook advertising your webinar is just to advertise posts to your blog. Getting people to click through and read your blog helps to transition them into a ‘warm’ audience. 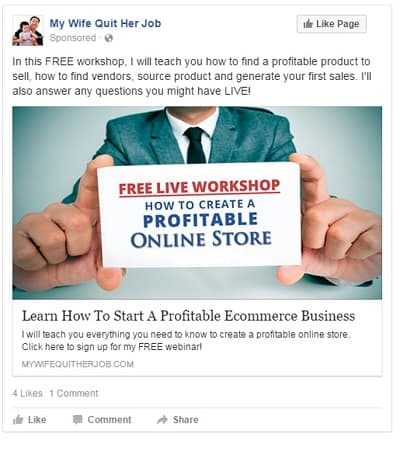 You can pitch the webinar within the post or retarget these people through other Facebook ads. We’ll get into more tips on how to promote your webinar in the next two sections but the idea is to make it irresistible. Offer so many freebies and so much value, highlighted on your landing page, that people feel like they are losing money if they don’t sign up for the webinar. Getting people to sign up for your webinar is one thing, getting them to actually attend and then pay for your product is another hurdle completely. Besides giving a great webinar, which we’ll talk about next, your email series is the way you accomplish all of this. 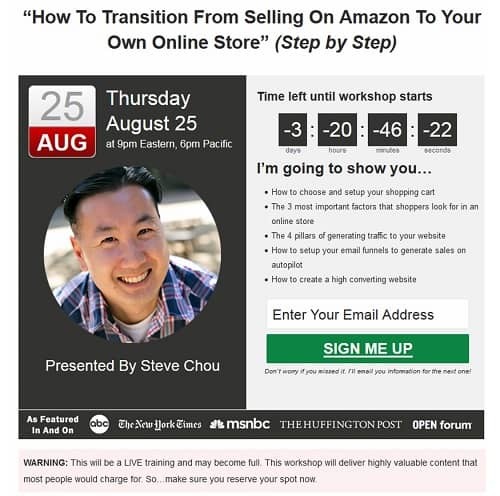 Steve only starts advertising and collecting emails four days before his webinars begin. This helps to build that sense of urgency into the promotion. It also means that people are less likely to forget that they signed up for a webinar. His goal for these pre-webinar emails, which he sends each day, is to introduce himself and get people excited about the webinar. Pre-webinar email #1 gives people a link to add the webinar to their calendar through a service on addtocalendar.com. It also highlights the day and time of the webinar. Pre-webinar email #2 starts a conversation with questions like what doubts they have about the topic and any questions they may have beforehand. It also provides an outline into what you will talk about in the webinar. Pre-webinar email #3 includes a video introduction of yourself and some testimonials from previous webinar guests. This is crucial to getting people comfortable with you to get them to attend the webinar and before you pitch your course. It’s said that you need six to eight ‘touch points’ with someone before they will buy something from you. We are flooded with so many commercials every day that we have built a deep skepticism to any product. It’s why email lists are so valuable to bloggers because you can keep bringing people back to your website to build that level of trust. It’s also why ad retargeting has become so popular because it targets people that already have seen you through the website. Pre-webinar email #4 emphasizes the freebies only available to people on the webinar. These can include bonus material, brief consulting calls and even small prizes. Steve also sends emails out the day of the webinar as reminders. These are sent 12 hours, one hour and ten minutes before the webinar starts. If you’re worried about sending too many emails, you might try only sending the 12-hour and the one-hour reminder on the day of the webinar. Steve gets a lot of course signups immediately after the webinar but to convert the rest, he uses a system of deadlines and emails afterwards. We’ll talk about the deadlines in the next section. Post-webinar email #1 is the replay of the webinar, in case somebody came in late or wants to remind themselves of specific points. Post-webinar email #2 offers a summary of webinar notes and includes affiliate links to any resources talked about in the presentation. The email also includes a FAQ video of most common questions, an in-depth walk through of the course and some testimonials of people that have taken the course. Post-webinar email #3 includes a video of a critique on someone’s ecommerce site and a worksheet people can use for their own site. These are freebies that Steve offers that offer great value even if someone doesn’t buy the course. The email also includes more testimonials from course participants. Steve ads a reminder in each email about deadlines for freebies and discounts for the course. I’ve sat through more webinars than I can count. There’s no one way to do a webinar, in terms of information offered, and many bloggers have found success with different methods. Some people will build up their expertise for half an hour, only leaving 15 minutes or so for information. It works for some…personally, I can’t stand it. If I take my time to attend your webinar, I want to learn something I can use without having to buy the full course or product. If I feel like I’ve just sat through an hour-long sales pitch, I am never going to attend another of your webinars or buy a product. Steve lives by the same idea when he gives his webinar. He tries to give participants so much value, so many freebies that they can’t help but wonder how great the actual course must be. If your full course can be separated into modules, consider using the webinar to deliver the first or second module and hold the rest for the course. Don’t worry about giving away too much information in your webinar. Give people something valuable, something they can really use and they’ll trust you. That trust will go a long way in converting people to your course. I like to use a combination of face-to-face presentation, slideshow and screenshare in my webinars to engage people and keep them interested. Face-to-face presentation is simply you sitting in front of the camera talking to the audience. It works well at the beginning to introduce yourself and make a personal connection. Slideshows of PowerPoint slides are important for giving information in bullets. Don’t be afraid to use lots of slides, even 70+ slides. This keeps people engaged by not spending too long on one slide and boring your audience. Screenshare is a great way to demonstrate resources and a process, it adds real value to how-to webinars. Be sure to keep a small box of your face in the corner to keep it personal. Again, this isn’t time to be vague and leave out big chunks of information. Give people something they can use and they will trust you as a source. Don’t be afraid to talk about your course. If you spend 30 minutes offering great value, your webinar participants will give you another five or 10 minutes to talk about the full course. In fact, if you’ve done a good job offering value then they will be excited to hear what they can get with the full course. People that have stuck around to the end of a webinar are very likely to buy so give them some individual attention with a Q&A session at the end. Make sure you use the first name of anyone that asks a question in your response. It helps to have an assistant field questions for you during the webinar, copying them down for the Q&A session. Stack the deck with a few planted questions where you can explain why your course is different and how it can help people. Steve uses a tiered-deadline for his course, yet another way to build sense of urgency in buyers. People that sign up before the webinar ends receive free software, a virtual pass to his conference and a discount on the course. Signing up by the second day after the webinar gets the discount and virtual pass. Signing up on the last day, the third day after the webinar, just gets you the discount to the course. Steve targets anyone that signed up for the webinar with another set of Facebook ads offering the webinar replay. You can upload your email list of webinar sign-ups into Facebook to target those people and keep them in your sales funnel. That’s Steve’s process and it makes him more money in a month than most people make in a year. If you want to sit in on one of his webinars, follow the link to his site Profitable Online Store and check out the full course. Webinars work and are a great way to sell your high-value products but there are psychological hurdles you might have to overcome beforehand. These are the little voices in your head that keep you from even starting a webinar. Fear that no one will show up. This is all part of learning how to market your webinar. Spend some time learning how Facebook ads work and don’t be afraid to put some money in marketing. Understand that even pros like Steve pay up to $5 per webinar signup and it takes almost 100 signups to become one customer. Fear that you don’t know how to run a webinar. 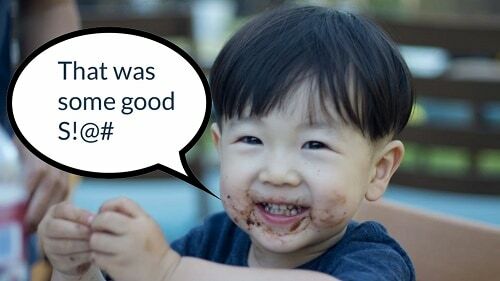 Don’t make your first webinar the one you spent $5,000 advertising! Many platforms like Webinar Ninja and Go-to-Webinar are cost effective and you can give a couple of webinars to test out your skills. Make these a part of a special offer to your email list to test out your course. Fear of the Impostor’s Syndrome. We talked about this one earlier and it’s one that strikes even the most experienced business people. Spend a couple of years to become an expert in your field and work on your own personal success. This will give you the credibility you need to sell your webinar and justify your course. Fearing that you don’t know how to sell. Overcoming this fear comes with your expertise in the subject. There is a point where you realize that your course is so valuable that it sells itself and all you have to do is talk about it. Let your past course participants sell it for you by sharing their testimonials and success stories after taking your course. If you want to make real money blogging, you need to sell high-value courses and products. Few bloggers ever got rich on $3.99 ebooks and printables. We’re talking WTF money that turns a profitable five-figure blog into a million-dollar business. If you want to do that, you’re going to need to a longer sales process and there are few ways better than the webinar. Follow this process and you will make money with webinars.